Whoops, he did it again! The newly-released Presidential budget again proposes eliminating the Institute of Museum and Library Services (IMLS), an independent grantmaking agency that provides approximately $189.3 million funding for libraries through the Library Services and Technology Act (LSTA). The proposal also cuts the Innovative Approaches to Literacy (IAL), a program administered by the Department of Education (yes, that’s Betsy Cruella DeVos’s stomping grounds) that helps school libraries buy books, materials, and training focused on serving students in underserved communities across America. LSTA and IAL probably give the biggest economic and social bang for the buck in the entire federal budget. LSTA grant funds go to every state, every year, according to a population-based formula. Each state contributes matching funds and decides how best to use their grants. Over the past few years in California, LSTA has funded improving access to legal information in Eastern Alameda County; computer training for adults; bringing books to communities without libraries; special needs and inclusive library services; summer tutoring; and so much more. Without this funding for libraries, Americans across the country run the risk of losing access to valuable services, training and education that are only possible when they’re supported by the federal government. Fortunately, Congress has prevented this exact travesty in previous presidential budgets; library services are one of the few things with bipartisan support. But it doesn’t happen in a vacuum. You need to make your voice heard! Ask your Members of Congress to publicly oppose cuts to federal library funding and commit to fighting for libraries throughout the appropriations cycle. Print postcards to mail to your Members of Congress! We’ve designed a sheet with four postcards for you to send to your two Senators and your Representative. Give the extra to a friend! Print on stiff paper, with your document set to landscape orientation. My name is _____, my zip code is ____, and I am a member of Indivisible East Bay. I am strongly opposed to cutting federal funding for libraries from the 2020 budget as the Administration wants to do. Federal library funding isn’t a big part of the budget but it funds important programs for everyone. These budget cuts would make libraries provide more services with less money, or cut services altogether. Our communities need our libraries and we need you to help save library funding through the Institute of Museum and Library Services, the Library Services and Technology Act, and the Innovative Approaches to Literacy Program. Our Members of Congress have been consistent opponents of Trump’s efforts to increase militarization of our country’s southern border. But on February 14, all of them other than Senator Kamala Harris voted for H.J. Res. 31, providing $1.375 billion for border “fencing,” rejecting Democrats’ demands to limits on funding for immigrant detention funding for ICE, and – perhaps most dangerously – setting no bounds on Trump’s ability to take funds granted to the Department of Homeland Security, the Department of Housing and Urban Development, or the Army Corps of Engineers, and use those funds instead to build his border wall. Please thank Senator Harris and put the others on notice that now that we’ve won the House, control of immigration detention funding is not something to compromise on. Read on for more info; call scripts and contact info below. We are thankful this is the first time since ICE was created In 2002 that a new spending bill didn’t increase its funding and that “the deal” only affects Customs and Border Patrol funding at ports of entry. But we are done settling for stopping things from getting worse. We elected a Democratic House of Representatives to make things better and going forward we expect our representatives not just to rein in, but also to cut spending on harmful immigration enforcement. The semi-good news is that there’s always something down the road, and in this case it’s a short road. In less than three weeks, the president’s Office of Management and Budget will release the president’s budget. We expect plenty of horrible funding requests on all sorts of issues, including requests for yet more “border security” and yet more detention funding. We want our MoCs to reject these, and we want them to go further – we want them to revoke “reprogramming and transfer authority” for all agencies that Trump is commandeering for this war on immigrants and asylum seekers. Specifically, we want our MoCs to vote to prohibit Trump from taking money allocated to the Department of Homeland Security, Health and Human Services, the Department of Defense, or any other agencies, and using it for his wall and inhumane immigration policies. Congress must seriously examine why there is so much slop in the system that these agencies can have billions – in some cases over $6 billion – that can be reprogrammed and transferred, in defiance of Congressional appropriations authority. My name is ____, my zip code is ____, and I’m a member of Indivisible East Bay. Thank you for voting against H.J.Res. 31. I’m very disappointed that so many Democrats agreed to a spending deal that didn’t cut funding for detention beds and didn’t limit DHS’s ability to use money Congress designated for other purposes as a slush fund for its harmful immigration enforcement policies. I hope Senator Harris stands firm and works to make sure that next year’s bill does both those things. My name is ____, my zip code is ____, and I’m a member of Indivisible East Bay. I’m very disappointed that the Democrats agreed to a spending deal that didn’t cut funding for detention beds and didn’t limit DHS’s ability to use money Congress designated for other purposes as a slush fund for its harmful immigration enforcement policies. I want ______ to work to ensure that next year’s bill does both those things. As the clock ticks down to another government shutdown, negotiations on the federal budget funding deal continue, with Senate leaders saying on February 11 that they reached a tentative agreement including $1.375 billion for border “barriers,” including 55 miles of new fencing. Unacceptably, the deal also excludes Democrats’ demands to limit immigrant detention funding for ICE. House Democrats must stay strong and reject any additional funding that will allow Trump to tear more families apart. choosing between protecting immigrants and keeping the government running is a false choice—especially with Democrats in control of the House. This bill goes too far in fueling Trump’s deportation force, even if it technically doesn’t have funding for a concrete wall. 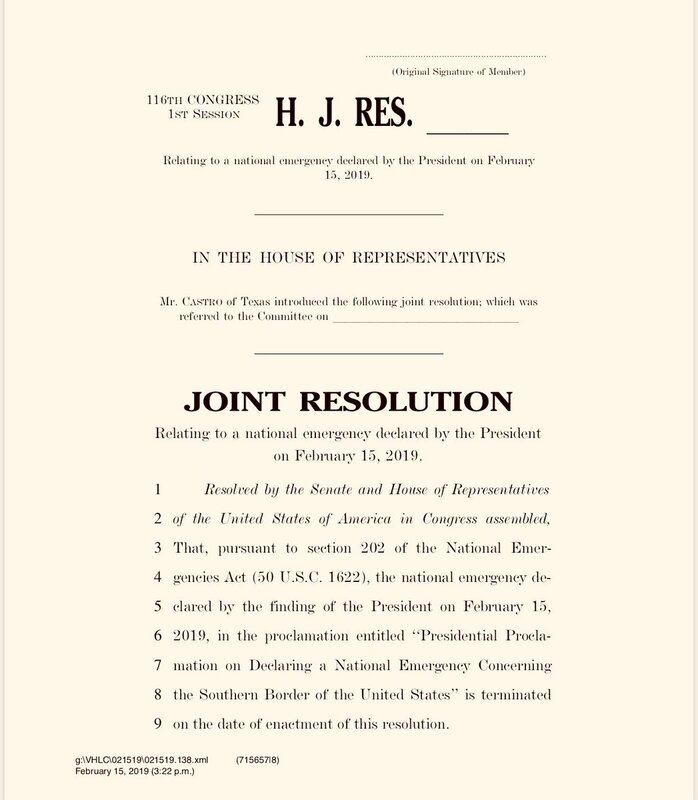 Congress still has time to pass a clean, year-long continuing resolution (CR), that would keep the government open, and that wouldn’t expand Trump’s deportation machine any further. Beds: In two years, Trump has dramatically expanded the number of immigrants being incarcerated. In President Obama’s last year in office, 34,000 immigrants were in ICE detention. Now the number is close to 50,000—far above the 40,500 for which Congress had authorized funding. How can ICE detain more people than Congress has authorized? Because DHS uses their transfer and reprogramming authority to effectively steal money from other programs, such as FEMA, to jail more immigrant families. It is Congress’s responsibility to end this financial shell game and add strict limits on DHS Secretary’s transfer and reprogramming authority. Boots: Negotiators are considering giving Trump more Homeland Security Investigation (HSI) agents. Don’t be fooled. HSI agents are ICE agents — and funding for HSI agents is funding for Trump’s anti-immigrant agenda. ICE HSI agents conduct highly militarized worksite raids. The National Immigration Law Center has a great resource with more information on HSI agents here. Congress must NOT increase HSI’s funding — it must cut it and prohibit HSI from arresting workers, while conducting this type of “papers, please” enforcement. Trump’s racist wall: Negotiators are currently considering including $1.375 billion for border wall funding, which will devastate local communities, as private land is seized using eminent domain, just so Trump can fulfill his hateful campaign promise to build his racist wall along the southern border. It’s critical to keep up the pressure on our Members of Congress and tell them NOT ONE PENNY for Trump’s hateful wall. There must also a policy rider to prevent Trump from using an emergency declaration to transfer and reprogram Defense Dept funding for wall construction. Call to Action: Ask your senators and House rep to reject any funding deal that expands ICE’s power, funds Trump’s border wall, and maintains DHS’s ability to “reprogram” money to ICE. My name is ___, my zip code is ___, and I’m a member of Indivisible East Bay. I’m asking ____ to reject the current working budget deal in favor of a bill that keeps the government open with NO new funding for increased detention beds, additional ICE agents, or Trump’s racist wall. Please don’t give in to threats of a shutdown and don’t let our country be held hostage. Please support ONLY a clean budget deal, and place strict limits on reprogramming and transfer authority! Deadline: February 15, 2019 – Tell our Members of Congress: Keep the government open, without funding for the border wall! Please thank our senators for their votes against the wall, and ask them to continue to vote against wall funding and all further immigrant detention and border militarization. Although neither of our Senators is on the bipartisan committee, they both work closely with the committee members (Sen. Harris on the Senate Committee on Homeland Security and Governmental Affairs and Sen. Feinstein on the Senate Appropriations Committee), so ask them to make this a priority in their discussions with their colleagues. My name is ____, my zip code is _____, and I’m a member of Indivisible East Bay. I want to thank Senator ___ for opposing funding for the border wall. I’m asking her to continue to vote against wall funding and all further immigrant detention and border militarization. And I hope she will do everything possible to persuade her colleagues on the bipartisan committee to keep the government open without giving into demands for this kind of funding. Our government should not be held hostage in this way. Representative Barbara Lee is on the bipartisan committee. If you are her constituent please thank her for her record to date and ask her to stand strong against funding for the border wall and all further immigrant detention and border militarization. My name is ____, my zip code is _____, and I’m a member of Indivisible East Bay. I want to thank Rep. Lee for opposing funding for the border wall. I’m asking her to continue to vote against wall funding and all further immigrant detention and border militarization. And I hope she will do everything possible on the bipartisan committee to keep the government open without giving into demands for this kind of funding. Our government should not be held hostage in this way. It’s mid-January 2019, and the Shutdown has reached its fourth week. We reported last week on how the Tantrum Over the Wall was affecting people nationwide, including some of the hundreds of thousands of federal employees who have been furloughed or must work without pay. This week, we’re looking closer to home: some federal employees you may never think about, right here in Alameda County, are being required to work without pay, and may be heading for dire financial straits. Close to 1,000 uniformed men and women of the U.S. Coast Guard live in Alameda County. Coast Guard Base Alameda is a major homeport of four Legend class cutters that go on months-long patrols: USCGC Bertholf, Waesche, Munro, and Dorothy Stratton. Each holds over 113 personnel, and some are on patrol now while their families are left behind to deal with the financial stresses of this shutdown. The 41,000 women and men of the U.S Coast Guard were paid once before January 1, and have missed their first bi-weekly paycheck in January. However, since Coast Guard members are considered critical personnel, they must work without pay during the shutdown. Of course, their expenses aren’t put on hold; nor are the literally life-or-death nature of the responsibilities some of them have, such as those at Station Golden Gate who participate in search-and-rescue. The government has responded to the situation by adding insult to fiscal injury, telling Coast Guard members to see themselves through the hard financial times brought on by the Current Occupant’s wall-inspired tantrum: Have a garage sale! Be a dog-walker! Be a mystery shopper! says a Coast Guard support tip sheet. “Yes, your credit score may suffer during this time,” it helpfully notes. “Bankruptcy is a last option.” Former Coast Guard Commandant Admiral Thad W. Allen has decried this shutdown as unnecessary political theater. Perhaps we should talk about moral bankruptcy of a government that refuses to pay the men and women who serve their country because one man insists on a so-called defense system that experts repudiate? No paychecks for government workers like our Coasties doesn’t just harm them and their families: it also means immediate economic impacts to their local communities and threats to the well-being of local businesses. Based on previous shutdowns of similar length (although this is now the longest government shutdown in US history), one study concluded that “the shutdown led to an immediate decline in average household spending of almost 10 percent” and “households with a member who was furloughed and required to stay home from work slashed their spending more dramatically – by 15 percent to 20 percent.” Some small businesses in the area are already reporting dramatic losses because the federal workers who are their frequent customers aren’t getting paychecks. People often ask me what I miss most as a retired Coast Guard officer: the service? Or the work? I always say: I miss the people. They are the most patriotic, inspiring, and unselfish people I have ever worked with. So during this difficult time for the Coast Guard, I’m looking for ways to help my old shipmates, and I can tell you there’s a great way to help. It’s the Coast Guard Mutual Assistance. I’ve seen first hand the amazing results of Mutual Assistance’s work to help the youngest and most vulnerable in the CG. I hope you’ll join me. You can donate to help a member of the Coast Guard on the Coast Guard Mutual Assistance website. My name is ____, my zip code is ___, and I’m a member of Indivisible East Bay. The government shutdown is hurting people and communities, all because of a wall that’s a terrible idea to begin with. I want to thank Senator Feinstein/Harris for voting against advancing legislation that wouldn’t have reopened the government without funding for the Wall. Please do everything you can to reopen the government without funding for the Wall. For more information and other call scripts, read our articles here and here. Ted Lam and Elizabeth Douglas contributed to this article. Photo of Coast Guard Island in Oakland Estuary between Oakland and Alameda United States Coast Guard, by Petty Officer 3rd Class Erik Swanson.